It’s my TailSpin Vinylmation! But wait! What’s this on the bottom? Are you kidding me Disney!!! You can take the time to jack up the price to $26.95 at the online store. You can go back and edit all your previously dated blog posts. But you can’t change the price tag on the item you charged me $26.95 for. After not owning up to it, that’s just insulting. Shame on you Disney. I am writing the customer service department and I encourage you to do the same. Just go to the DisneyStore.com page and click on “contact us” and fill out the email form. 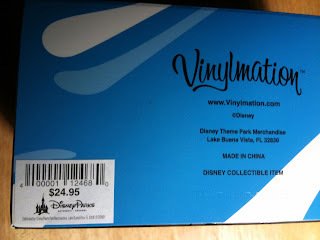 In case you missed it, check out our post calling attention to the price change with a screen shot of the $24.95 price Disney went back and changed after our post. What do you think of this TailSpin saga? Just sent them a pretty strongly worded email. Ugh, this whole thing is rubbing me the wrong way. Yea, I agree they had these things in production and out to ships months ago though. They have everything planned out for the end of the year, and those pictures (concept) designs you see are actually stuff that they planned last year. That was really and insult for them to not stay with the 24.95 price tag and lends itself towards the packaging but still though the way they left us in the dust was absurd. I think that the rest of the series will still have the 24.95 price tag because of this issue. 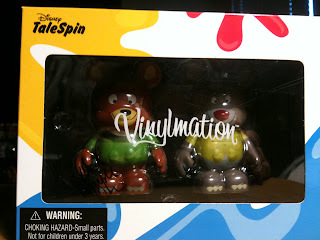 I’m getting a very bad feeling about this Vinylmation craze. Just as was the case with pins, Disney kept increasing the price and frequency of releases. So much so that it soured me to pin trading. They floded the market with too many pins and it just became overwhelming! I see this starting to happen with Vinyls, I love them but with so many coming out I fear Vinyls will go the way of pins for me! Walt wouldn’t be happy. Greed. Sure greed from the appearance of it. And Disney usually pays attention to details. Poorly played. Disney Junior: Live on Stage Debuts!